A five-days-a-week column to be grave but gay (in the old sense), pungent but subtle, learned but light. 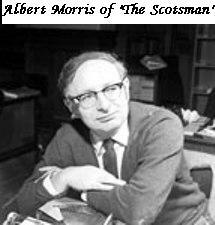 Articles by the Scotsman's legendary feature writer, Albert Morris, from 29 December, 2001 to 8th April, 2005. Our thanks to John Henderson for pulling all this together for us. "In 1970, Alastair Dunnett, the then editor, summoned me to his room where I found him at a window gazing pensively at the North Bridge; editors earn their money easily. In portentous tones, as one announcing the Four Horsemen of the Apocalypse under starter’s orders at the Grand National, he said: "Albert, I’m offering you a column with thirty bob (£1:50) a week expenses and all the tripe you can write." It was an offer I couldn’t refuse and although my expenses increased, I have stuck rigidly to the spirit and practice of the offer’s last part. Alastair indicated he wanted my then five-days-a-week column to be grave but gay (in the old sense), pungent but subtle, learned but light rather like a cross between the styles of the French essayist Montaigne and the music-hall comedian, Max Miller. Readers can judge whether I succeeded. One columnar midnight, when Alastair saw me at the typewriter, prose-purpling on a real wham-bang mind-moulder about my toothbrush’s place in Einstein’s Theory of Relativity, he said in the demotic, "Ease up laddie or ye’ll bust yer biler", an adjuration I accepted gratefully. " Article 55 - Oh chip shops of Scotland, when will we see your like again?